Michael Hinni, M.D. 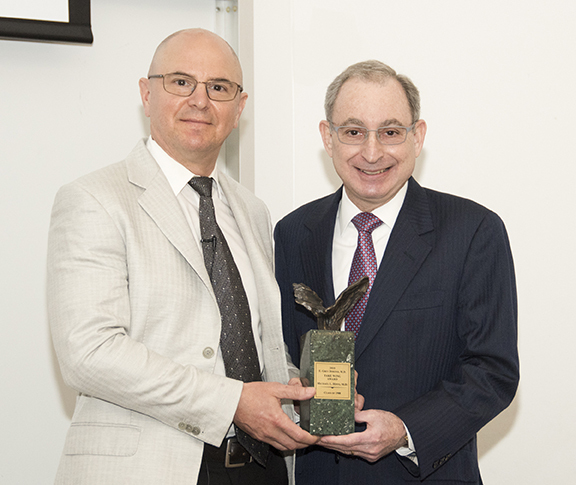 ’88, received the 2018 E. Grey Dimond, M.D., Take Wing Award from School of Medicine Dean Steven Kanter, M.D., on May 21. “For many medical students, usually the specialty picks the person, and not the other way around,” said Michael Hinni, M.D. ’88, the 2018 winner of the E. Grey Dimond, M.D., Take Wing Award. If that’s the case, surgery made a great choice with Hinni, a pioneer in performing and then teaching innovative head and neck surgery, all while building an academic department. “I needed to fix things, so surgery attracted me,” Hinni said. School of Medicine Dean Steven Kanter, M.D., presented the award to Hinni on May 21 in Theater A as part of the annual Take Wing Award lectureship. After Hinni graduated from UMKC’s B.A./M.D. program, his internship in general surgery and residency in otorhinolaryngology were at Mayo in Rochester, Minnesota. After that, he was hired at the Mayo Clinic in Arizona, where he now is a professor of otolaryngology and head and neck surgery and head of the Department of Otolaryngology. He also had a year’s fellowship in Germany studying transoral laser microsurgery — surgery that removes head and neck tumors through a patient’s mouth rather than cutting through the neck and jaw. Hinni brought the technique back in 1994 and became one of the first two U.S. surgeons to use it extensively. Hinni said the surgery offers great benefits to a patient, cutting hospital stays from 10 days or two weeks to three days, greatly reducing the difficulty of recovery and allowing patients to eat and speak by avoiding a tracheostomy and extensive reconstructive surgery. Along the way has treated some well-known patients, including U.S. Sen. John McCain and Buddy Bell, the former Major League third baseman and Kansas City Royals manager. Hinni also built the otolaryngology program at Mayo in Arizona, which had little research or academic offerings when he first was hired. He built the Arizona location’s thyroid surgery practice, and Mayo Rochester residents came for some of their thyroid surgery experience. He also trained residents from the military, first from the U.S. Air Force and then the Army and the Navy. Eventually that meant he had two residents training year-round. In 2006 the Department of Otolaryngology Head & Neck Surgery/Audiology launched an independent otolaryngology residency program with Hinni as its founding director. Along the way, Hinni helped design the instruments needed to accomplish better, safer surgery; contributed to the published medical literature on such topics as how much tissue needs to be removed to completely clear malignancy from the throat and surrounding areas; and presented the evidence for these medical advances at local, national and international forums. Hinni also looked forward to returning to UMKC to receive his Take Wing Award, give the annual lecture at its presentation and address the 2018 School of Medicine graduating class.